Regular dentistry significantly extends your horse’s life expectancy and improves overall well-being. Did you know that the teeth of horses receiving regular dental care wear an average of 29% slower than horses not receiving care? This means that horses getting regular dentistry will retain the ability to eat roughage much longer than untreated horses, significantly extending their lifetimes. We understand that regular, appropriate dental care is one of the most important services that we provide to our equine patients. All of our doctors are highly trained in all aspects of equine dentistry including performance dentistry, maintenance dentistry and geriatric dentistry. We utilize a full range of hand and power assisted equipment. Following is more information on why this aspect of equine health is so critical to every horse’s well-being. Like humans, horses can develop a variety dental problems, some of which may be very serious and require surgery. It is therefore important that horse owners have their animals’ teeth checked regularly, to head off any potential issues, and examine the teeth should the horse exhibit any signs of dental problems. Abnormal teeth not only affect the horse’s comfort while chewing, but also commonly manifest themselves as disobedience while the animal is ridden. For many performance-related problems, it is often best to check the teeth to rule out that factor. Horses evolved as grazing animals and we have modified their diets and eating patterns considerably through domestication and confinement. A horse grazing on a pasture has a much different chewing pattern when eating than a horse eating hay or grain. A horse eating hay does not need to use the incisors (the teeth in the front of the horse’s mouth) to shear off the grass stems and uses an abbreviated chewing motion to process the hay compared to grass pasture. This results in less wear on the incisors and often uneven wear on the cheek teeth. This uneven wear can cause the development of high and low areas on the cheek teeth arcades termed ramps, waves, ridges and hooks. The abbreviated chewing motion of confined horses also results in the development of sharp points on the edges of the cheek teeth which can injure the tongue and cheeks making the process of eating, which nearly every horse lives for, a painful event. This is not to say that horses on pasture do not need dental care, but they do tend to have a more even wear pattern and fewer problems than confined horses. Most of us are also aware of the changes that develop in young horses mouths as they age. Horses shed 24 deciduous (baby) teeth called ‘caps’ between the ages of two and five and erupt up to forty permanent teeth. This process can be problematic and retained or fractured caps can be very painful and interfere with the training and performance of a young horse as well as causing weight loss. Wolf teeth, the small vestigial first cheek teeth, can cause painful bitting issues if not removed before a bit is placed in the horse’s mouth. We demand more of our performance horses at a younger age than ever before. Dental care during this stage of a horse’s life can prevent these problems and insure that the training of these horses occurs without dental pain. When a horse reaches the age of five he or she is said to have an adult mouth, meaning that all the deciduous teeth have been shed and all the permanent teeth are erupted and in wear. The teeth consist of exposed crown, which is the part showing above the gum line, and reserve crown, the part imbedded below the gum line. Throughout their remaining lifetimes these permanent teeth slowly wear and continue to erupt. The reserve crown becomes shorter and shorter as eruption replaces the tooth lost through wear. Late in life, the loss of reserve crown results in the teeth becoming less well anchored in the socket and the older horse loses the ability to chew with enough pressure to properly pulverize the forage into a form that can be efficiently digested. This is the main reason why older horses become ‘hard keepers’, and why we often need to feed them processed feeds to help them maintain their weight. Modern equine dentistry is focused on maintaining the horse’s mouth in a state that maximizes the horse’s ability to chew and process food efficiently. The term ‘dental equilibration’ which implies a more holistic approach has replaced the older term of ‘floating’ to describe equine dental care. Dental equilibration involves more than just reducing the sharp points, hooks, ramps and waves that develop over time. It involves balancing the horse’s mouth in a manner that evens out the forces over the four arcades of cheek teeth as well as the upper and lower incisors resulting in maximum efficiency as well as maximum comfort for the horse. This also results in a much more even wear pattern across the entire mouth. Recent research has shown us the importance of regular dental care in ensuring the longevity of the teeth. It turns out that the teeth of horses with malocclusions (uneven dental arcades) erupt 29% faster than the teeth of horses with well maintained dental arcades. What this means in practical terms is that horses with poor occlusion will develop problems with processing roughage and run out of teeth much earlier than horses getting regular dental care. Besides the more obvious benefits of a lower feed bill and a happier, more comfortable horse this turns out to be the single best reason to take good care of your horse’s teeth. They will live longer. Twelve premolars and twelve molars commonly known as cheek teeth or jaw teeth. Twelve incisors, or front teeth. Between 4 and 5 canine teeth (tushes, tusks) between the molars and incisors. Generally all male horses have four canines. However, few female horses (less than 28%) have canines, and those that do usually have only one or two, which many times are only partially erupted. Between zero to four wolf teeth, which are vestigial premolars and not canines as the name may suggest. About 13-32% of all horses also are born with wolf teeth, with most of those having only one or two. They are equally common in male and female horses and much more likely to be on the upper jaw. If present these can cause problems in the bitting of the horse as they can interfere with the horse’s bit contact, and may also make it difficult to rasp the second premolar. Therefore, wolf teeth are commonly removed. The incisors of a horse. A horse’s incisors, premolars, and molars, once fully developed, continue to erupt as the grinding surface is worn down through chewing. A young adult horse will have teeth which are 4.5-5 inches long, but the majority of the crown remaining below the gumline in the dental socket. The rest of the tooth will slowly emerge from the jaw, erupting about 1/8″ each year, as the horse ages. When the animal reaches old age, the crowns of the teeth are very short and the teeth are often lost altogether. Very old horses, if lacking molars, may need to have their fodder ground up and soaked in water to create a soft mush for them to eat in order to obtain adequate nutrition. Commercially prepared hay pellets and Hay cubes can be moistened for this purpose. Beet pulp may also be a suitable feed. The equine dental arcade,showing the space between the incisors and the first premolars, where the bit sits.Contrary to popular belief, the bit of a bridle is not held between the horse’s teeth, but lies in the “interdental space.” This space lacks teeth, providing an area for the bit to rest without forcing the jaws open, and occurs between the cheek teeth and the incisors (or canines, should the horse have them). However, if the bridle is adjusted so that the bit rests too low, or (more commonly) too high, it may push against the teeth and cause discomfort. Sometimes, a “bit seat” is filed in the first cheek tooth. A veterinarian rounds the surface, so that, when the bit is pulled, the flesh of the cheek is not pushed into the sharp edge of the tooth. Although this practice is disputed, and most agree that an extreme bit seat can indeed be harmful, many veterinarians believe it makes riding more comfortable for the horse. It is possible to age a horse using signs of the tooth eruption and wear. However, this is not an exact science, and become increasingly difficult after the horse is “aged.” Horses are individuals, and two horses of the same age may have difference wear patterns. There are 24 deciduous teeth (also known as milk, temporary, or baby teeth). These come out in pairs, and are pushed out later by the permanent teeth. The number of permanent teeth may vary, depending on if the horse has wolf teeth or canines. Most mares have 36, and most male horses have 40. By age five, all permanent teeth have usually erupted. The horse is then said to have a “full” mouth. Shetland ponies: The middle and corner incisor (both deciduous and permanent) usually erupt later than the average horse. 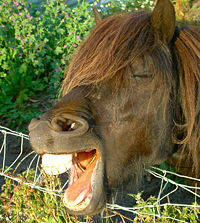 Draft horses and miniature horses: the permanent middle and corner incisors usually erupt later than average. The incisors, showing the wear and marks on their tables. After eight years, indeed good authorities say after five years, the age of a horse can only be conjectured. Dishonest dealers sometimes “bishop” the teeth of old horses, that is scoop them out, to imitate the mark: but this can be known by the absence of the white edge of enamel which always surrounds the real mark, by the shape of the teeth, and other marks of age about the animal. The wear of teeth may also be affected by diet, natural abnormalities, and cribbing. Pulp mark/Dental star: After some wear has occurred on the teeth, the central pulp cavity is exposed, and the tooth is marked by a “dental star” or “pulp mark.” These begin as a dark line in front of the dental cup, which grows in size and becomes more oval in shape as the cups are worn away. Dental stars are usually first visible at age 6, on the animal’s lower central incisors, and very visible by age 8. They appear on the lower intermediates by age 9, and on the other incisors between the ages of 10-12 years. Hook/Notch: A hook appears on the upper corner incisor around age 7, and disappears by age 8. It reappears around age 13, again disappearing about 1 year later. 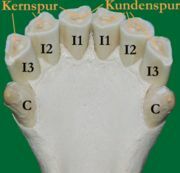 Galvayne’s Groove: The Galvayne’s groove occurs on the upper corner incisor, producing a vertical line, and is helpful in approximating the age of older horses. It generally first appears at age 10, reaches half-way down the tooth by age 15, is completely down the tooth at age 20. It then begins to disappear, usually half-way gone by age 25, and completely gone by age 30. Lower jaw shape: Older horses may appear to have a lean, shallow lower jaw, as the roots of the teeth have begun to disappear. Younger horses may seem to have a lumpy jaw, due to the presence of permanent teeth within the jaw. Angle and Shape of the incisors: As the horse ages, the angle of the incisors generally becomes more acute, slanting forward. The incisors gradually change their form as the horse ages, becoming round, oval, and then triangular. The Household Cyclopedia of General Information, published in 1881. Illustrated Atlas of Clinical Equine Anatomy and Common Disorders of the Horse, Vol. II. Riegel, Ronald J., and Susan E. Hakola. Equistar Publications, Limited. Copyright 1999. Equus. “Healthy Teeth, Healthy Horse.” November 2006, pp 31-39. Sound Mouth-Sound Horse, The Gager Method of Equine Dental Care. Gager, E.R., and Rhodes, Bob. Emerson Publishing Company. Copyright 1983.